Today my card is adding to my masculine birthday card stash and I was inspired by the current CAS-ual Friday Stamps challenge. I love their sketches as they make you think more creatively. I used a CAS-ual Fridays stamp set called ‘Shenanigans” for my main focus sentiment, stamped using Catherine Pooler Design inks in It’s a boy, Fiesta blue and Something borrowed with some Momento tuxedo black. 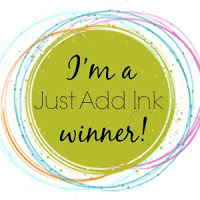 I used Stampin Up Whisper white and Not quite navy card stock. Some blue and white twine from the Twinery finishes it off. Today my card is a cheeky birthday card inspired by the current challenge over at Sieze the Birthday where the topping is to use candles on your birthday card. I used that cheeky pig stamp I got from my friend Jo in Adelaide (not sure where she got him but he’s adorable) and I coloured him with my Stampin Up Blends, then fussy cut him out and popped him up on some dimensional inside the circle of candles stamp from the Winner & Walter set ‘Ring in the Celebrations’ which was embossed in Melon Mambo from Stampin Up. The sentiment is from a set by Simon Says Stamp called ‘Wishing you hogs and kisses’. For the final touch I added a little bit of Melon Mambo twine and I was done – oink oink! Author tinstar05Posted on February 12, 2018 February 5, 2018 5 Comments on Happy Pig Day!